This page mentions UE 5G NR Search Space Types. It describes search space types viz. Type0, Type0A, Type1, Type2, Type3 and UE specific search space sets as defined in 5G NR standards. 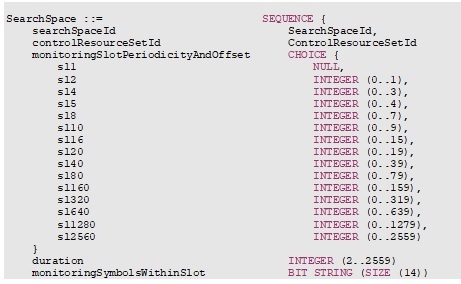 It mentions fields used in Search Space information element (IE) used by RRC layer. • It is similar to LTE search space. • It is the area in the downlink frame where PDCCH might be transmitted. • This area has been monitored by the UE to search for the PDCCH carrying data (i.e. DCI). • There are two types of search spaces viz. common and UE-specific. These are mentioned in the following table. UE specific search space • This set configured by SearchSpace in PDCCH-Config with searchSpaceType = ue-Specific for DCI formats with CRC scrambled by C-RNTI, or CS-RNTI(s). 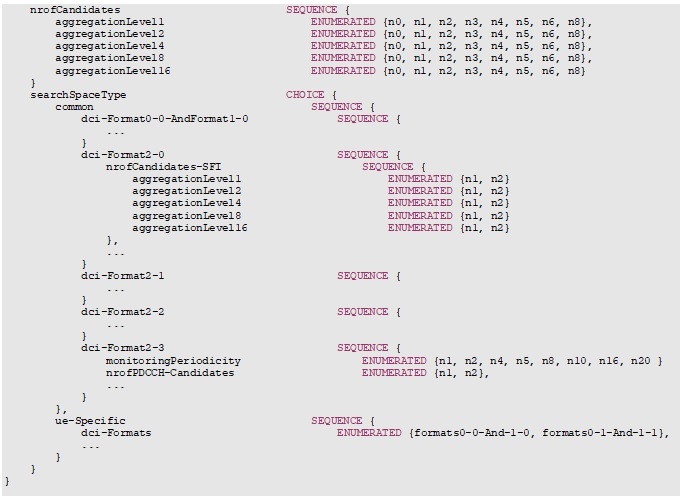 • Following structure mentions various fields used by RRC Search Space Information Element (IE). • This IE defines how and where to search for PDCCH candidates. • Each search space is associated with one ControlResourceSet.